This CellML version of the model runs in PCEnv and COR to recreate the published results shown in figure 2 of the original paper. The units have been checked and they are consistent. We would like to thank the author of the original model, Steven Webb, for making the original source code available to us. The host immune response to a tumour can be divided into two basic, overlapping stages: the first is a phase of cell to cell recognition and interaction between the host lymphocytes and the target tumour cells, and this is followed by a stage of lymphocyte mediated killing of the tumour cells by apoptosis. However, in an evolutionary arms race between the host immune system and the tumour, some tumour cells have developed various strategies to evade both stages of the host immune response. One of these strategies is for tumour cells to kill activated lymphocytes through their synthesis and secretion of the death ligand, FasL. This ligand binds to the death receptor Fas (also known as CD95) which is expressed on the surface of the activated lymphocytes, and this interaction triggers the apoptotic pathway in the lymphocyte. The binding of Fas and FasL can be controlled, at least in part, by the cleavage of FasL into a smaller, less cytotoxic, soluble form (sFasL) by matrix metalloproteinases (MMP). In addition, certain cells are able to secrete sFasL by alternate splicing of Fas mRNA transcripts. In combination, both these phenomena can lead to the down-regulation of the immune response. Tumour-immune cell dynamics have been the subject of several theoretical studies. 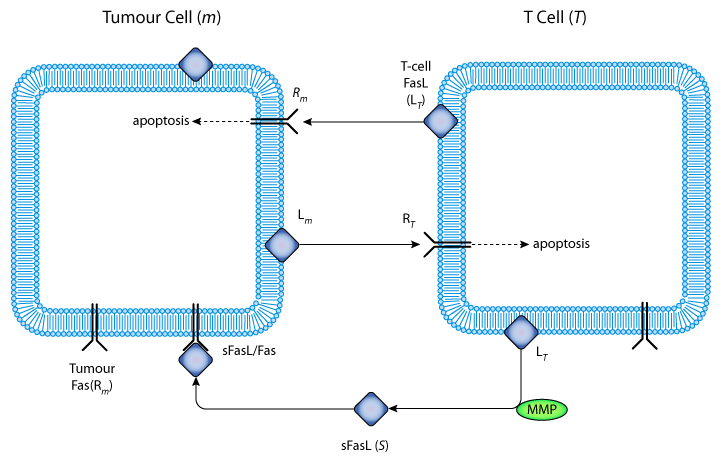 In the paper described here, Steven Webb, Jonathan Sherratt and Reginald Fish have developed a mathematical model of the Fas/FasL system to investigate Fas-FasL binding and the induction of lymphocyte apoptosis in the process of tumour-induced immunosupression. Model simulations demonstrate how the constitutive expression of FasL by tumour cells is a potential mechanism of immune evasion, and the model predicts that sFasL can act as an inhibitor of the Fas death signal. In addition the model considers the enzymatic cleavage of FasL into sFasL, and predicts that the inhibition of MMP cleavage activity causes Fas sensitive lymphocytes to undergo Fas-mediated apoptosis faster than the Fas-resistant tumour cells. The model consists of a set of ordinary differential equations which represent the binding of Fas and FasL for each cell type. Schematic representation of the interactions between FasL, soluble FasL, and Fas receptor during an immune attack against a tumour cell. Cytotoxic T-cells recognize tumour cells, and are activated to express FasL. FasL then binds to Fas on the surface of the tumour cells and induces their death through apoptosis. Some tumour cells also express FasL, and T-cells express up-regulated Fas, probably because of activation in response to tumour antigen. This enables the tumour to counterattack the cytotoxic T-cells: FasL expressed on tumour cells binds to Fas on the T-cells, which then die by apoptosis before they can attack the tumour. FasL is cleaved by a MMP to produce the soluble form sFasL. This is functional, and may bind to Fas, forming membrane-bound sFasL/Fas complexes, which are quickly internalized. Derived from workspace Webb, Sherratt, Fish, 2002 at changeset 4bf56747532b.